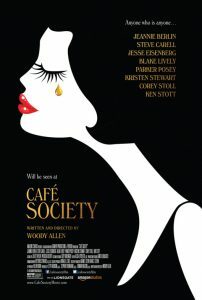 Set in the 1930s, Woody Allen’s bittersweet romance CAFÉ SOCIETY follows Bronx-born Bobby Dorfman (Jesse Eisenberg) to Hollywood, where he falls in love, and back to New York, where he is swept up in the vibrant world of high society nightclub life. Centering on events in the lives of Bobby’s colorful Bronx family, the film is a glittering valentine to the movie stars, socialites, playboys, debutantes, politicians, and gangsters who epitomized the excitement and glamour of the age. Café Society‘s lovely visuals and charming performances round out a lightweight late-period Allen comedy whose genuine pleasures offset its amiable predictability.